The same plants you admire growing wild in the meadows and mountains and along the stream beds in Pennsylvania become invasive weeds when the seeds end up in the middle of your lawn. The plants have deep roots and if the whole root is not removed, the plant will grow again. Herbicides that target just the weeds and leave the lawn alone are a remedy. Check with the local county agent for what is allowed in your area. 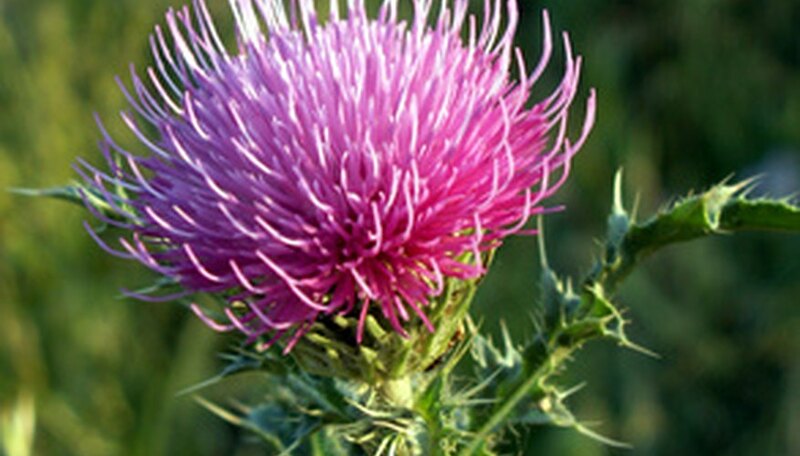 Canada thistle (Cirsium arvense) is a member of the aster family. The weed grows from 1 to 3 feet tall with light-green stems and lance-shaped leaves that grow from 3 to 8 inches long and up to 1 inch across with yellow thorns along the edges. The disk-shaped, pink or lavender flowers grow in clusters that measure less than 1 inch across from early through mid-summer. The weed grows in full sun and a variety of different type of soil. New plants will grow if even just a tiny bit of root is left in the soil. The plant is a favorite of butterflies, bees and birds. Common burdock (Arctium minus) is a member of the aster family. The plant is a biennial producing low-growing base leaves up to 2 inches long and 1 1/2 inches wide the first year and light-green to reddish-green stems from 3 to 6 feet tall the second. The stems produce leaves resembling the base leaves, only smaller and pink, purple or white spiny flowers up to 1 inch across growing in small clusters from mid-summer to early fall. The flowers are followed by round, brown burs. The plant has deep roots and will re-seed itself. Common burdock grows in full or partial sun and in different types of soil. Bees and butterflies will stop by for the nectar. Hemp dogbane (Apocynum cannabinum) is also known as American hemp, bowman's root, Choctaw root, dogsbane, Indian hemp, rheumatism weed and snake's milk. The plant grows to about 4 feet tall and produces elliptical-shaped leaves that grow from 2 to 6 inches long, small green-white, bell-shaped flowers growing in clusters at the ends of the stems from late May to mid June and reddish-brown seed pods that are 4 to 8 inches long. The weed is native to all of North America and reproduces both by seed and by sending out creeping roots. Hemp dogbane prefers gravelly, moist soils. Yellow rocket (Barbarea vulgaris arcuata) is a biennial that grows from 1 to 2-1/2 feet tall. The first year, the plant produces base leaves that grow up to 1 inch across. The second year, the plant produces flower stalks and lobed base leaves up to 6 inches long and 1 inch wide. The stems have leaves that are similar too, but smaller than, the base leaves on the bottom and leaves that are 2 inches long and 1 inch wide with shallower lobes at the top. The yellow flowers and seed pods grow in the same clusters--the flowers on the top and the pods on the bottom. The weed prefers full sun and a moist fertile soil.